Forrester Senior Analyst Christopher Condo and Tricentis Distinguished Evangelist Ingo Philipp explore how mature organizations can transform their testing processes—achieving the speed and efficiency vital for digital transformation. With the growing adoption of agile and DevOps across enterprises in every industry, test automation is on many technical teams’ radars—and if it isn’t now, it soon will be. We surveyed testers and QA leaders to assess current levels of test automation, how quickly its implementation is progressing and how enterprise organizations are harnessing test automation to meet their specific needs. As software practitioners, we often approach a new initiative by thinking about tools and technology first. But when faced with a major undertaking like DevOps transformation, that can become a problem. That’s because we don’t spend enough time thinking about the people implementing those tools, and how they will fundamentally affect processes and culture. In this webinar, Brian Dawson, DevOps Evangelist at CloudBees and Ryan Yackel, Director of Product at Tricentis, will discuss the key elements of DevOps transformation and how QA teams can start getting into the mindset of the cultural and process shifts that DevOps brings — and why it’s important to do so before the conversation about tools and technology begins. Data Warehouse and Big Data testing is fast-becoming a new opportunity for testers. If your organization isn’t already recruiting traditional testers to safeguard data quality, they probably will soon. Are you up for the challenge? watch two data warehouse testing leaders for the webinar Data Warehouse Testing—The Next Opportunity for QA Leaders. Wayne Yaddow is a data warehouse testing consultant who literally wrote the book on data warehouse. Raj Kanuparthi is a senior quality leader who drove the big data testing initiative at one the world’s leading financial service companies. Tricentis has gotten them together to give you a realistic look at why quality leaders are making data testing an integral part of their quality process, and the role that Tricentis Tosca experts are playing in these transformations. DevOps and Agile teams have already recognized that today’s “low-code/no-code” application development approaches are an efficient way to satisfy the relentless demand for more software, faster. Yet, most continue wrestling with the high-maintenance, script-based approach to software delivery and automated testing designed decades ago. Breaking up isn’t just hard to do — it can be downright brutal. Sometimes it seems so much easier to maintain the status quo, regardless of how miserable you are. But this way of thinking causes us to stay in relationships that aren’t working for far too long. No, we’re not talking about your personal relationships. We’re talking about your relationship with dated testing technology! Many enterprises are growing increasingly frustrated by this relationship with HP testing tools — but when is it time to walk away? We’ll wrap up with a 6-step plan for moving on. The global pace of change is only increasing. Consumers demand efficient self service technology based products and services 24/7. This webinar will focus on the why, strategic and infrastructure decisions behind implementing an automated or DevOps software delivery model. Topics such as workforce culture, people, processes & infrastructure themes will be covered to support those seeking knowledge and guidance around this challenging global subject. IDC recently found that over two-thirds of SAP users are already planning their company’s future with SAP S/4HANA and Fiori 2.0. It’s no longer a question of if your SAP architecture will change; it’s a matter of when. - Automated tests architected for previous generations of SAP platforms must be rebuilt. - Existing testing processes don’t suit the new faster (and more fragmented) release cycles, with different components evolving at different speeds. - Within the SAP ecosystem, testing must address new technologies such as SAP SuccessFactors, SAP Ariba, and SAP Hybris. - Reinvented business processes commonly extend beyond the SAP ecosystem, including APIs, mobile, mainframes, and so on—but legacy testing approaches often do not. Join Ryan Yackel as he presents qTest’s BDD maturity model, which will help you assess your team’s progress on the journey to BDD maturity. Ryan will provide a framework for understanding where your team is now on the road to BDD maturity and our recommended steps for getting to the next level. The transition to BDD often comes with significant bumps in the road, but in our experience it is well worth the effort. Teams with mature BDD practices report higher levels of collaboration across functions and also tend to be more advanced in their DevOps release processes. By shifting testing left with BDD, these teams are delivering faster without sacrificing quality. How do you drive quality changes in your organization? How do you get leaders to understand that software quality is a critical priority for agile teams that can help you get to market faster with software users will love? Join us as quality leaders Adam Satterfield and Elise Carmichael share strategies for becoming a quality champion and building a practice that can accelerate DevOps initiatives, and improve both software delivery and business outcomes. The discipline of testing will continue to broaden, become more visible and grow more critical to the success of today’s leading enterprises in 2019. We’ve rounded up the top nine trends that will shape the future of software testing in 2019 and beyond. In this webinar, you’ll hear about the changes our product experts are seeing in the market and learn how they’re likely to affect your approach to software quality and your business in 2019. You’ll also learn how qTest is shaping the future and leading innovation in test management and see a preview of key innovations slated for the 2019 qTest roadmap. During this webinar, Nick Jones, Vice-President of Software Delivery Acceleration and Test Engineering at a leading payment processor, will share how the Test Engineering team led the organization's first DevOps initiative, gaining buy-in from stakeholders across the business to modernize software development, testing and delivery practices, ultimately reducing deployment time from 14 hours to 4 minutes. During the initiative's early days, the team established a Center of Excellence and a grassroots Community Practice to build trust and reinforce partnerships with development, senior leadership and business stakeholders. Both initiatives have helped improve collaboration and spread new ideas, tools and methods across the business. The result is DevOps pipelines that have significantly reduced delivery timelines and improved production quality, which successfully processes and settles millions of payment transactions daily. 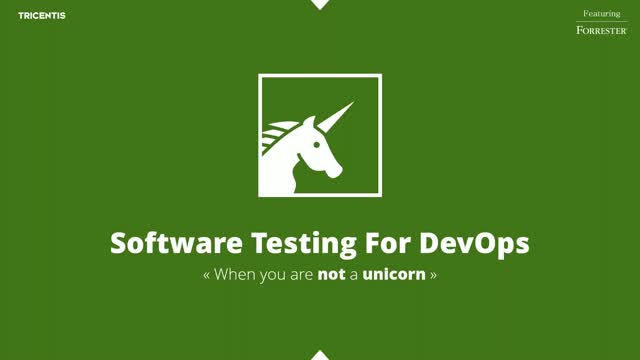 In this webinar, we'll highlight a popular testing methodology for DevOps: behavior driven development (BDD). We’ll discuss the history of BDD and its roots in test-driven development, its key principles and benefits for DevOps, and best practices for getting started with BDD and scaling the practice. In today’s hyper-competitive software market, companies are ever pressing to deliver products more quickly and efficiently. As a result, it is imperative for organizations to implement a more strategic approach to quality. A strategic approach requires QA teams to gather more comprehensive data on the value of quality tasks in the delivery pipeline. And it often requires a different approach to reporting, and a focus on metrics that help the business measure release readiness and assess overall application quality. Join us as Adam Satterfield shares the key metrics today’s software QA teams should be collecting, how to tell the story of your data and how to better understand different audiences within your organization to deliver insights that matter. Ryan Yackel will also dive into how some of these insights can be applied in qTest Insights. To achieve rapid time-to-market, businesses have embraced DevOps, which places a premium on speed and efficiency. But speed is not the only measure of DevOps success. To release better software faster, enterprises must optimize testing strategy and embed a culture of quality within their DevOps processes. In this webinar, Brian Dawson, DevOps Evangelist at CloudBees and Ryan Yackel, Director of Product at QASymphony, will discuss the key elements of DevOps transformation and how QA teams can start getting into the mindset of the cultural and process shifts that DevOps brings — and why it’s important to do so before the conversation about tools and technology begins. In this session, Mario Matthee shares insights into a real life project that was completed by DVT. DVT’s testers were responsible for the testing of a new investment bot, and in the process we faced many challenges: distributed teams, being too agile, red tape (banks have plenty of this), complex financial models, ever-changing requirements and more. Mathee shares the story of how his team took DVT’s first bot live using behavior-driven development methodology and a mixture of manual and automated testing. You will learn that BDD is not as scary as it is made out to be, that there is a place for manual testers in BDD, that you can be agile and still work in your own way. So you decided to buy a test management tool. Now that you have it, how do you make it work across all agile teams? How do you allow scrum teams enough freedom to inform you about the quality of their scope while at the same time maintaining a structure that makes sense in a high-level report for all stakeholders? In this session, Dutch Railways’ Niels Rikze presents his framework for effectively implementing qTest for agile test management across teams. Tricentis’ industry-leading Continuous Testing Platform provides automated insight into the business risks of your software releases—transforming testing from a roadblock to a catalyst for innovation.